If I hired a kitchen organizer who insisted I only keep one serving piece in my kitchen, I’d select my wooden salad bowl–I use it daily. 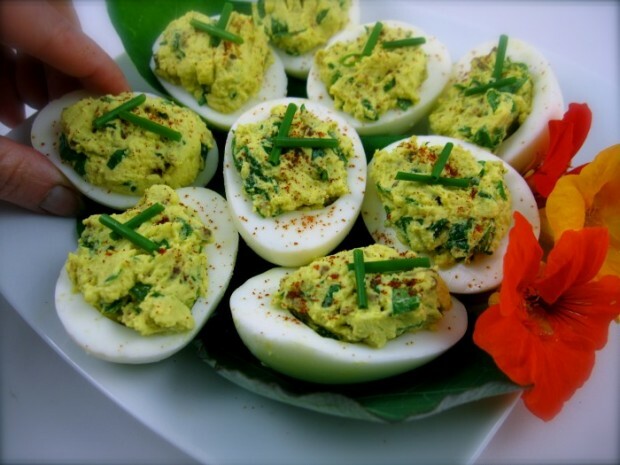 Flash 40 years back to my mother’s kitchen: Being presented with the same ultimatum, I’m pretty sure she would have kept her stuffed (deviled) egg plate, she made some variety of stuffed eggs a couple of times a week. I am just remorseful her coveted stuffed eggs plate has disappeared since my “inheritance” of the platter, about 20 years ago. The eggs, when stuffed, just don’t stand upright without those egg-shaped indentations to support them. Never mind. Nasturtium leaves keep them from rolling around. Pieces of leaf lettuce would serve the same purpose, if you lack the proper platter. I added the turmeric to intensify the yellow color. It’s addition is optional and you may not need turmeric if using local eggs– I’ve noticed their bright yellow yolk color is far more intense than mass-produced chicken eggs. This recipe would be perfect for a Fourth of July picnic–they are economical, may be made up to 24 hours in advance, and are absolutely delicious. My mom had several recipes for stuffed eggs. This recipe was one of the more “dressed up” versions, and has always been my favorite. She added a bit of bacon fat to the yolk mixture, and I would encourage its addition, if injecting additional cholesterol is not a concern. This recipe makes an awesome egg salad sandwich, by the way. Just chop up the egg whites and increase the dressing. Remove yolk from eggs and place them in a bowl. Using a fork, combine the mayonnaise, mustard, turmeric if using and chopped chives into the yolks to form a smooth paste. Stir in bacon and spinach and season to taste with freshly ground pepper.